Coupla links -- 'cause it's been a long time. Larry Portzline at the Bookstore Tourism blog has a thoughtful review of the documentary film about independent bookstores that's been causing a lot of buzz (in our little world). Jacob Bricca's "Indies Under Fire: The Battle for the American Bookstore" tells the story of the pitched battle between Borders and independents in the Bay Area. Hopefully we can bring a screening of the documentary to a New York book industry audience sometime soon, perhaps through Emerging Leaders; Larry's review makes it sound like a fascinating conversation starter. 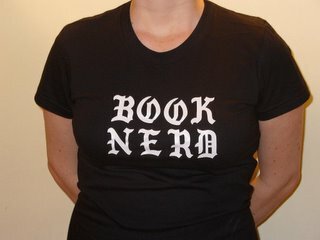 Bookseller Chick (who is SO good with the posts and links; how, how do you find the time?) had a little guest blog series recently, including former bookseller David De Beer on "The (Gradually Changing) Bookstore Environment". His insights into indie bookstore customers' resistance to change (at least shocking, overnight change) were eye-opening and yet extremely familiar -- I guess our patrons are the same the world over (David lives in South Africa). It's the birthday of Aubrey at Episode Soldier! Read her Billy Collins poem and wish her a happy day. Simon Owens at Bloggasm has the results of a survey (which I participated in) about diversity in the blogosphere; fascinating stuff. The literary blogs aren't as male and white as some categories, but I'm still surprised by the 65% male majority, since the majority of the ones I read are written by women. Any thoughts? Dan Wickett of Emerging Writers Network and the Litblog Co-Op, and Steve Gillis of 826Michigan have launched a new venture: Dzanc Books! From what I understand, it's a combination non-profit indie press and literacy/education organization -- sounds exactly like what I know of Dan, and what I know of the awesome 826 projects like 826NYC as well. Congrats, guys -- looking forward to seeing the great new stuff to come from Dzanc! Okay, that's it for today -- I'm off to meetings and confabs galore, oh my! Stay tuned in general for further developments -- I've got a backlog of book reviews and commentary and questions to share in the weeks ahead. Happy reading!